from last couple of months after enormous research done. After Keerthi Suresh, Samantha and Dulquer Salmaan, latest sensation to join the shoot from tomorrow is Prakashraj playing Chakrapani of all time prestigious banner Vijaya Vahini banner. 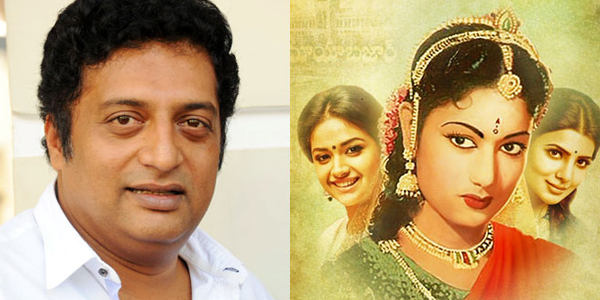 Mahanati being made with a strong script, Nag Ashwin is selecting prominently talented artists for different characters. Aluri Chakrapani Garu was an important person, multilingual writer, producer and director known for his works in predominantly in Telugu cinema, notable for his association with Vijayq Vauhini Studios, one of the largest studios in Asia at that time. Chakrapani garu was also a partner of Vijaya Productions banner along with B Nagi Reddy and founder of Chandamama children magazine. Mahanati is produced by Swapna Cinema and prously presented by Vyjayanthi Movies.